Why Didn't Michael Pena Hit Bigger After 'Crash'? Michael Peña is by no means doing badly for himself. After churning away for a few years in studio bit parts and indie movies, he got serious attention for his work in Paul Haggis' Crash and has elevated to a mid-major character actor who's consistently booking good work in film and television. But considering his talents, should Peña have broken bigger? Michael Peña is by no means doing badly for himself. After churning away for a few years in studio bit parts and indie movies, he got serious attention for his work in Paul Haggis' Crash (his big scene is the featured image on its poster) and has elevated to a mid-major character actor who's consistently booking good work in film and television. But considering his talents, should Peña have broken bigger? Peña, born to Mexican immigrants in Chicago, had a pretty typical rise in Hollywood, starting out with parts like "Drug Dealer" and "Orderly" in movies you've never heard of, then a small sidekick role in Nicolas Cage vehicle Gone in 60 Seconds, then a couple of decent-sized parts in indies Buffalo Soldiers and The United States of Leland. Neither were particularly acclaimed movies, but Peña made a ripple in both, and it was enough to book him a ticket to respectability. Peña is in Best Picture winner Million Dollar Baby, but it's a tiny part. Still, it probably helped land him his crucial role in the following year's Best Picture winner Crash, which was written and directed by Paul Haggis (who also wrote Baby). Many patriotic Americans have done their best to blot this manipulative, desperately cheesy movie from their memories, especially considering its unfortunate Oscar win, and Peña's scene in particular sums up everything about what works and what's infuriating about the movie. A well-meaning locksmith, he's cornered by an angry Iranian store owner brandishing a gun for dumb coincidental reasons, and his daughter rushes out to save him, thinking she's protecting her dad with a magic cloak that he gave her to calm her down. The guy accidentally fires just as she jumps into his arms, and the sound cuts out and the music swells as Peña screams in horror. But for some other dumb coincidental reason, the guy is firing blanks, and everyone's okay, and the audience that was gripping their seats tensely a moment ago is granted a feeling of overwhelming relief. It's an ABSURD scene, and yet it's very difficult to watch and not get drawn in. I knew exactly what was coming and I still choked up watching it this morning (I am, it should be noted, a ridiculous baby). That should have been the scene that transformed Peña's career. 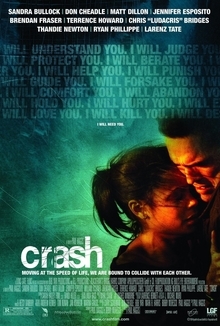 Along with the Thandie Newton car-rescue scene, it's the most memorable part of a movie that was briefly a phenomenon, and Peña's work is about as subtle and heartfelt as it can be considering Crash's inherent flaw (which is that it's didactic garbage). When Crash collected its Oscar, Pena already had some good stuff in the can, particularly a season-long arc on The Shield. Coming off of Crash, he landed a small role in another Best Picture-nominated ensemble piece, Alejandro Gonzalez Iñarritu's Babel, and the second lead in Oliver Stone's World Trade Center, which centered on the two cops rescued from under the rubble of the towers after 9/11. Stone's film was done in a straightforward manner and sought to avoid any controversy, and although it did fine at the box office, it was quickly forgotten. Peña's solid work as a soldier in Afghanistan in Robert Redford's similarly sober 2007 drama Lions for Lambs was also forgotten, mostly cause the movie was so boring, and an above-the-line role in Neil Burger's The Lucky Ones (again playing a man in uniform) basically never made it to theaters in 2008. By this point, any lingering goodwill from Crash would have faded. Why didn't things break quite right for Peña? He took safe roles, mostly within the Crash wheelhouse, playing cops and soldiers, usually as a second or third fiddle to a bigger name. The lack of starring roles for Latino actors in big-budget movies would certainly count against him. Peña also has the look of a character actor—he's handsome, but well into his thirties he sports a bit of a baby face, and he's short and stubby, easily pigeonholed playing loveable sidekicks. Peña still plays a lot of guys in uniform, but he's finding himself better roles. His brief turn as a corrupt mall cop in Observe and Report tapped into a skill for comedy we hadn't seen before, which led to some great work on Observe director Jody Hill's TV series, Eastbound and Down, and later comedies like 30 Minutes or Less and Tower Heist. He was the co-lead of the underrated cop drama End of Watch, for which he nabbed a deserved Indie Spirit nomination. He was part of the Gangster Squad as Robert Patrick's partner (that's a sentence). Not all of these films hit, but Peña is a more memorable part of each, after being handed noble but uninspiring work directly after Crash. This year, Peña is the star of a prestige drama, Cesar Chavez, a Diego Luna-directed (huh?) biopic of the legendary activist. It will likely get buried by its April release, but it's still good to see the role of one of America's greatest Mexican-Americans going to a deserving actor like Pena, and it's nice to see him dominating a poster for the first time since Crash. End of Watch director David Ayer's next project, the Brad Pitt World War II drama Fury, will see Pena get back into uniform later this year, and he's booked a role in 2015's Ant-Man which will certainly help keep him in the public eye. Peña's not going anywhere, and his talent is undeniable. Whether it's a matter of him finding the right leading-man project that hits at the right time, or just continuing to put out consistently strong supporting work until he nabs a great role or an Oscar nomination, he's likely going to have another moment. But hopefully the Hollywood landscape, and his career decision-making, find him in a better spot than we did after the success of Crash.